Update: Since traveling more frequently I don’t stock my Etsy shop any more. 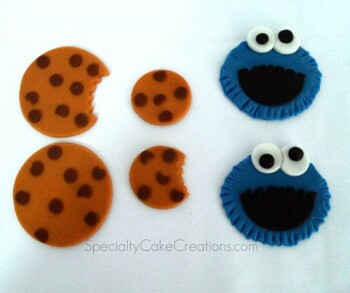 If you are following on facebook you have already seen these Cookie Monster cupcake toppers in the making. 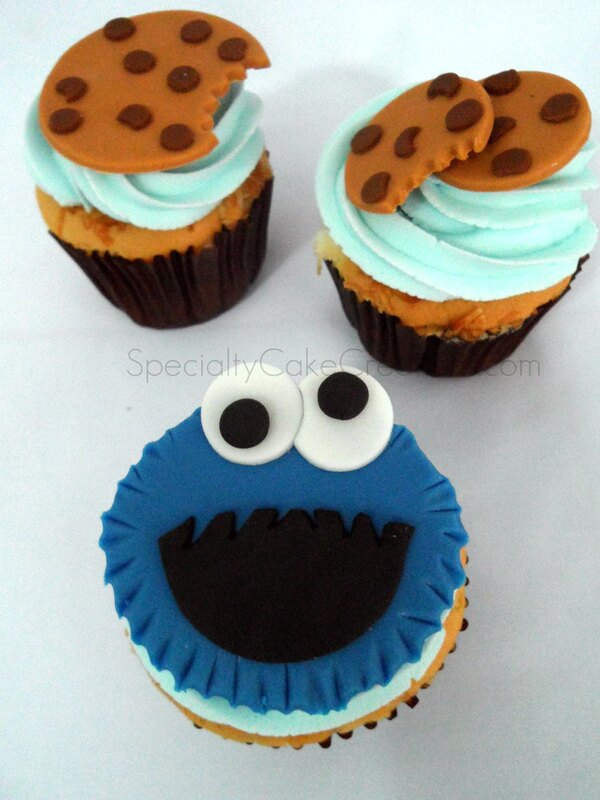 But this is more than just another cute fondant decoration. It means a lot more. These cookie monsters and cookies mean that I have finally figured out how I can use fondant/gumpaste in the tropical humid climate of Thailand. A while back, I already managed to make fondant here, but it was extremely sticky to handle. Little decorations that I made dried a bit during the day, but over night became soft and gooey again. Thanks to a tylose powder provider in the UK (quick and reasonably priced delivery to Thailand) and to a rotation and covering routine I developed (pieces dry outside, covered from sunlight during the day, and inside, protected from humidity at night). That also means that I am finally back on my Etsy shop. Yay! Some of you might have noticed that for a while there were no listings in the shop. But until I had everything figured out, from fondant handling in humidity and shipping, I saw myself forced to pause my listings. 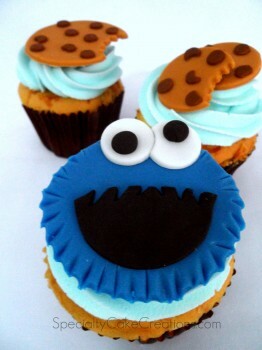 Now, I am back however, with these Cookie Monster decorations as newest listing. And hopefully many more to come in the near future. I am trying to make toppers like this for my sons birthday in 2weeks. But having trouble!!! Can you help me please! How do you make the shape the Cookie Monster face, the eyes, and mouth and the hair kinda over the mouth so perfect! I’d really appreciate your help and advice! :) I want his desserts to look perfect! Hi Kiah, for the face I cut out a blue circle and then cut off a little more from one side with the same circle cutter to make it look more like an oval. Then I made indentations all around the edges with a slice tool (or the back of a knife will work too) to give it the fuzzy look. 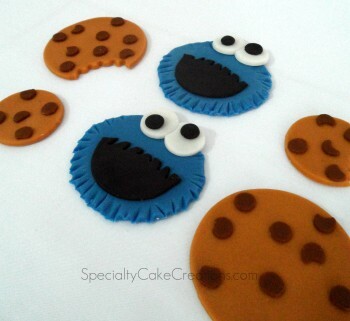 The mouth is made similarly, from black fondant with a smaller circle cutter, just make it a more pronounced oval. Then cut out little triangles/strips from the top side to make it look like hair is growing over. For the eyes make to small white circles. To make them fit snugly next to each other, cut out a little oval from one circle using the same round cutter. Hope this helps Kiah. Maybe some day I’ll be able to put together a tutorial for these. I would love to see your finished project for your son’s birthday!